The NYU Tandon School of Engineering is now accepting applications for their new master’s of science degree program in translational surface engineering. The first students to enroll will start in the autumn 2016 semester. This course covers the emerging field of chemical engineering at the molecular and nanoparticle levels. Traditional surface engineering courses focus largely on solid surfaces and the new degree program will still include these. 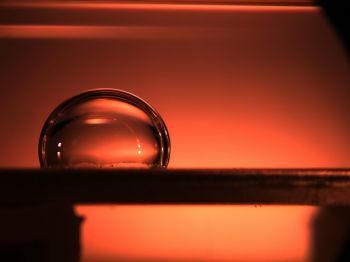 What’s new is that the program will also focus on providing a strong academic grounding in the surfaces of soft matter, including surfactants and colloids such as those found in almost all liquid manufactured goods. Though surfactant science is extremely important to commercial and industrial practices, surfactant systems at the air/water, water/oil or water/solid interfaces are rarely taught. This is despite their critical nature in the coatings, pharmaceutical, food and cosmetics industries. Surface engineering techniques can solve energy-robbing friction, corrosion or wear problems, for example. Surface engineers also optimize the interface between medical implants and tissue to promote healing. 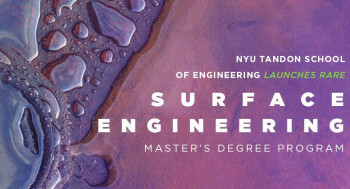 The NYU Tandon two-year master’s program will reach beyond the health and biomedical focus typical of translational engineering, and educate students on how to translate basic surface science across various fields – such as electronics, pharmaceuticals, cosmetics, paint, bioengineering, food processing, coatings and more – into engineering solutions that can be adopted by industry. Students can choose between a traditional research track culminating in a thesis, or a major project. This project will require students to propose an industrial application using knowledge they acquire through the program. The new master’s program was developed by faculty of the NYU Tandon department of chemical and biomolecular engineering. They in turn consulted with researchers and hiring managers at major corporations in order to understand their needs when it comes to hiring engineers. As a result, the translational surface engineering program requires coursework in a characterization laboratory that will give students experience, using tools they will encounter in their professional careers. “Our goal is to provide students—whether they are recent recipients of bachelor's degrees or mid-career professionals seeking to better position themselves within industry—with the tools to engineer properties of surfaces and interfaces and to put that knowledge to practical use," explained Abraham Ulman, professor of chemical and biomolecular engineering and program lead. "They will develop creative material-interaction problem-solving abilities and will undoubtedly be highly sought after by major coating, food, agriculture, pharmaceutical, household, personal care, and cosmetics companies, as well as research labs," Ulman continued. Admission requirements for the program include having a BS or a more advanced degree in chemical or mechanical engineering, physics, physical chemistry or bioengineering with a minimum GPA of 3.5. Applicants should also have 12 or more credits of math, two semesters of organic chemistry and at least one semester of physical chemistry. "This is among the first master's degree programs to address molecular-level chemical engineering with a hands-on lab component strongly focused on translational research," said dean Katepalli R. Sreenivasan. "This new degree program modernizes our curricula offerings, is highly relevant to students' interests and addresses workforce demands for graduates who will receive a solid foundation in surface engineering and its related disciplines." For more information on the Masters of Translational Surface Engineering at NYU Tandon, visit the program website.